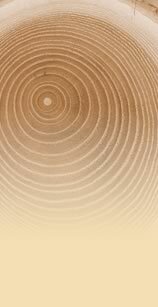 We thought you might like to know what we get up to at Woodfellas... here is the news. Christmas Tree Donated by Woodfellas Carpentry and Eco Doors to the Teenage Cancer Trust. The Teenage Cancer Trust (TCT) is the only UK charity dedicated to improving the quality of life and chances of survival for young people aged between 13 and 24 diagnosed with cancer every day. 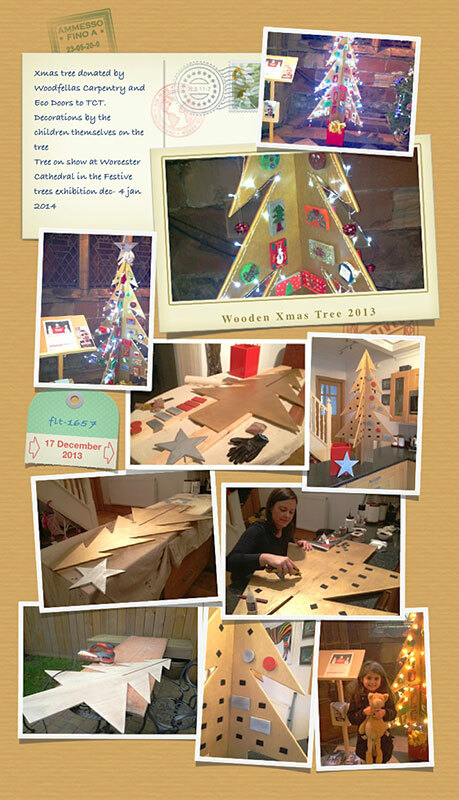 Woodfellas and Eco Doors designed and constructed a Christmas tree to be decorated by TCT children that is now on display at Worcester Catherdal in the Festive Trees Exhibition until 4th January 2014. All the decorations on the tree have been made by teenagers and young adults who are receiving treatment in three TCT units based in the West Midlands, Birmingham Children's Hospital, University Hospital Birmingham (QE) and the Royal Orthopaedic Hospital. Wishing one and all a very merry Christmas and a prosperous 2014. Staff and apprentice round up, May 2011. Jake (pictured top left) is undergoing work experience with Woodfellas to gain skills in carpentry and joinery. We hope to offer Jake a full time, three year indentured apprenticeship working with in conjunction the CITB in September 2011. This will enable his progression through the construction industry on a guided pathway. Nicholas (pictured right) is working full time at Woodfellas on main structural building works with Richard Slammon, our H&S and Development Officer. The experience Nick is gaining with listed buildings and restoration will hold him in good stead for the future. Nick is due to be offered a full time apprenticeship in September 2011. We are very proud to have such high calibre young personnel on-board. It takes time, patience and dedication to qualify for an apprenticeship, not only for the employee but also the employer. 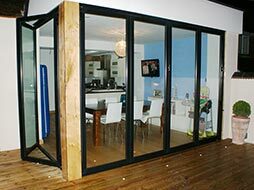 Woodfellas skills and craftsmanship is forged from apprentice based training and we are always mindful of the opportunities this offers within our industry. Carpentry work for Newcastle-under-Lyme fire station contract awarded by Thomas Vale Construction to Woodfellas in April 2011. New fire station to replace the existing station. Fitted out with the most modern technology and facilities it will also have a communal gym. Completion scheduled for September 2011. Woodfellas have been awarded the contract for the refurbishment of all carpentry and joinery works to Grange Court, a Grade II listed building and new extension for the general public. Grange Court was commissioned to be built by the Kings Carpenter John Abel in 1633, it has been visited by the Queen Mother and the Queen in the last century, it is one of the main attractions of buildings in Leominster set in the main park area and is a source of pride for the local community. Woodfellas have an experienced history of works to grade listed buildings and relish the challenge of restoring the building to its original historical state. Woodfellas carpenters were invited to build and structurally design a new 34 apartment cattery with beds (and TV's). Pet Central Hotel, an established boarding kennels and cattery located in Sambourne, near Redditch required luxury accommodation for their feline boarders. The timber framed building comprised an efficient design constructed with latest thermal and environmental technology. Woodfellas tasked with finishing carpentry works to aid Morgan Sindell Construction complete building works. Contract completed in December 2010. As part of our continuing programme for excellene within our trade, we have created a Health, Safety and Environmental section on this website. It offers an overview of our policies and useful links to key health and safety criteria. This is essentail for our customers and workforce to ensure we are up to date and fully compliant with current regulations. Our full health and safety policy is available for download (Woodfellas customers only) on request by calling 0121 4755513. You will be issued with a username and password for access. 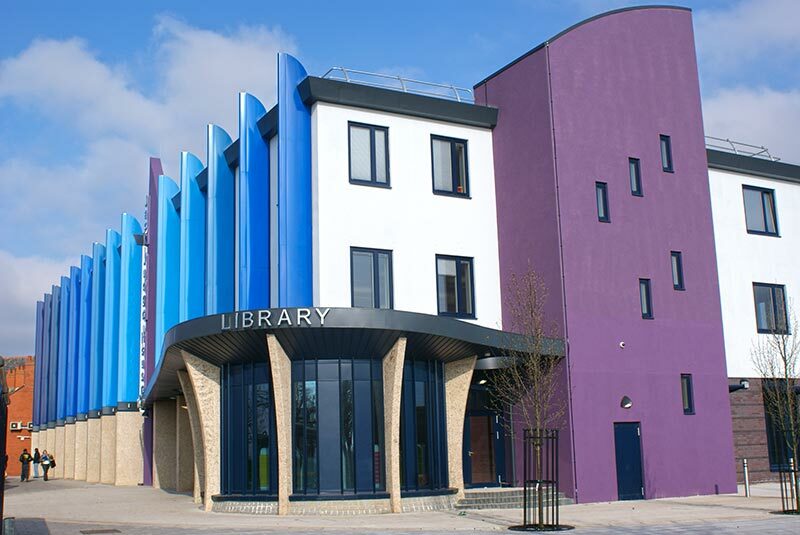 Birmingham City Council provide Local Authority Building Control services to ensure the safe construction and condition of all types of buildings in Birmingham. 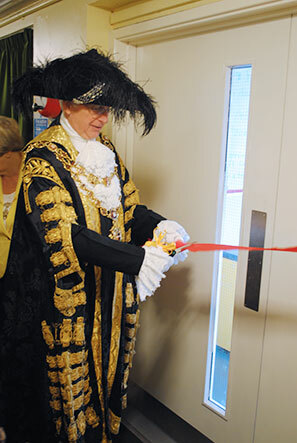 In this way, they help protect the health and safety of all people who use those buildings. They check that a building is built to the standards of the Building Regulations. Woodfellas are accredited and featured on this cd-rom. It offers reassurance and standards compliance to contractors, sub contractors and domestic customers. A copy of the cd-rom can be obtained by contacting Building Consultancy Direct on 0121 675 7006. Woodfellas are now registered and CRB checked to service Age Concern customers within the Birmingham metropolitan area. We can be found in the Tradesperson and Handyman Directory by calling the Age Concern team on 0121 262 3020. What a great couple of months for awards! Two in such a short space of time, although it took 25 years to get here. Now, my main objective is to try and keep the traditional aspect of the trade and teach the new generation so we don't lose the skills, knowledge and finish we once took for granted. 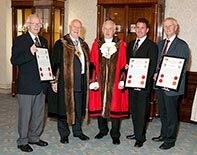 I received my Master Carpenter and Joiner award from the Institute of Carpenters on 1 June 2010 at Carpenters' Hall, London. 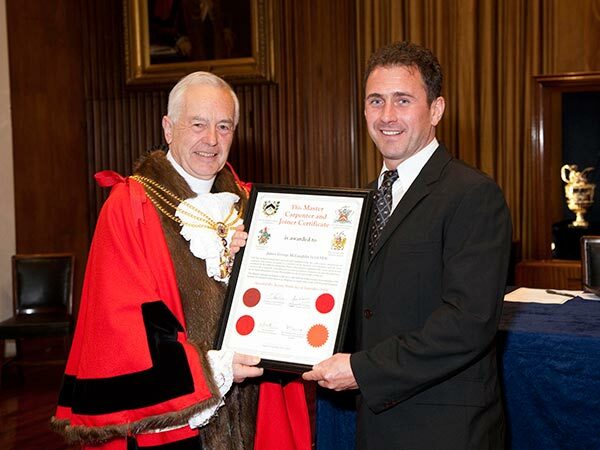 The award was presented by Sheriff of the City of London, Peter Cook. 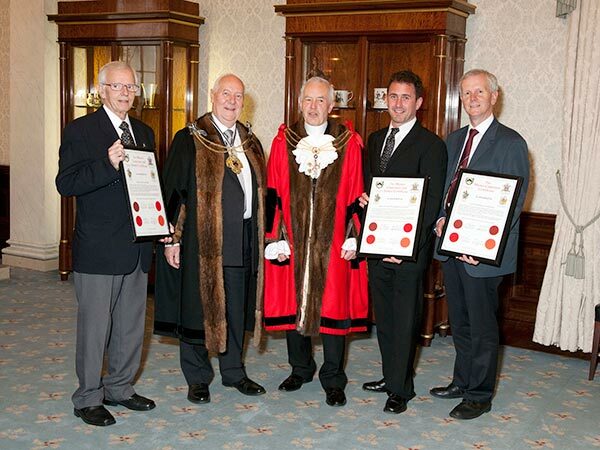 Then a few a weeks before, I received my award of Licentiatship presented the by City and Guilds of London on 8 May 2010 in the Merchants Taylor Hall, Threadneedle Street, London. The award was for Building Construction over the last 25 years. 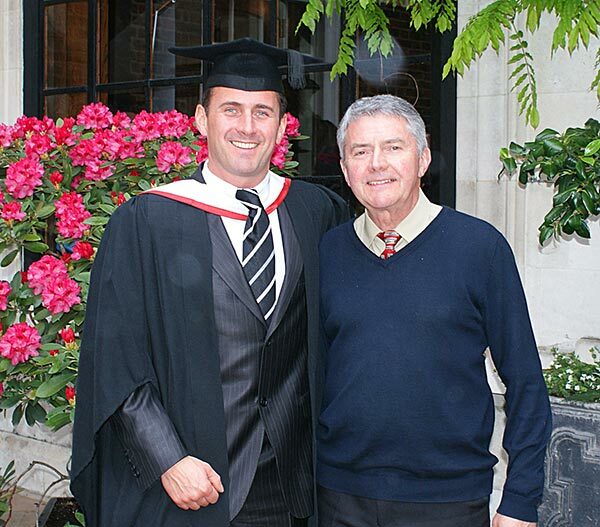 I brought my father and sister with me which was a very proud moment for myself and family. What made the presentation even more special was that I was the 100th awardee of this prized accolade. 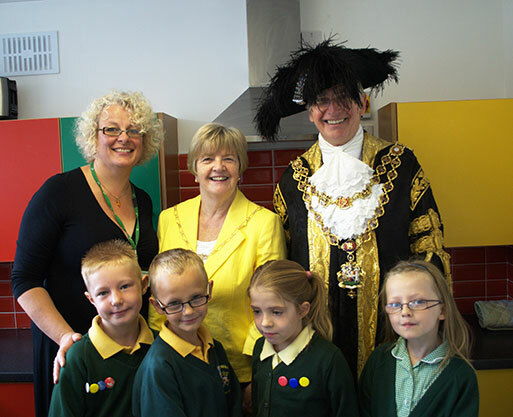 The Lord Major of Birmingham, Councillor Len Gregory, visited Princethorpe Infant School to open the new Lego kitchen designed by Woodfellas and DJF kitchens. 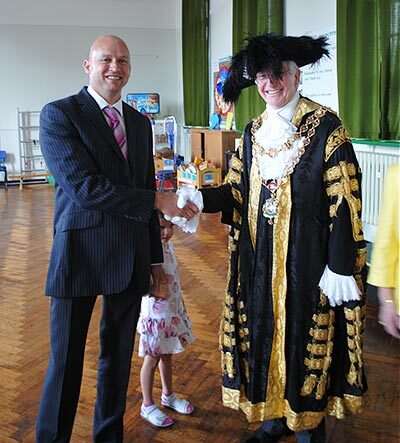 Dean Raven (Director) took his daughter Ruby Raven to meet the Lord Mayor at the press opening. Dean proudly explained all the major construction works we were involved in around the school. He also commented on the continuing good working relationship we have built with the head teacher Mrs. Sarah Jane Wright. 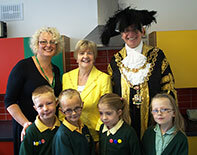 Princethorpe Infant School now moves into the 21st century with the completed works. You can view the project here in more detail. We are proud to say that we are still invited back to carry out further works at the school. 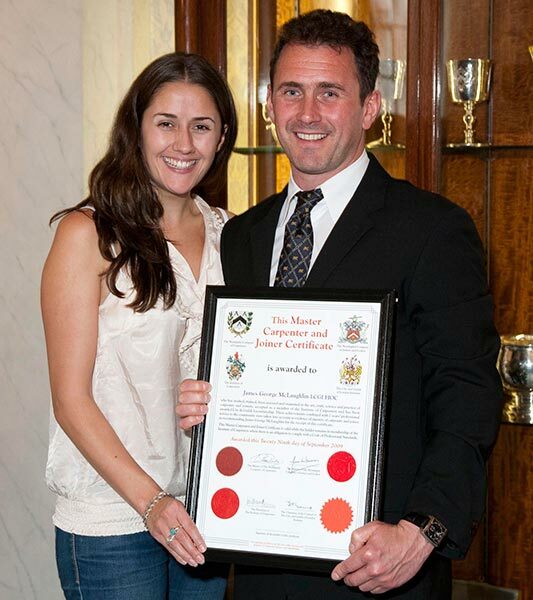 Managing Director, James has also been invited to main board of directors of the Institute of Carpenters, London. He will operate as the Southern Regional Chairman in his new role. James takes over from Don Stevens and will report back to the board on how all the regions are functioning. The IOC pass on their thanks to Don for all his hard work in the past. Congratulations to Dean Raven (Director) on the birth of his new son Connor. Born 19 January 2010 and weighing 8lb 11oz @ 9.25am! Completion of our design and build project (period living) in Cotton Hackett, Birmingham. 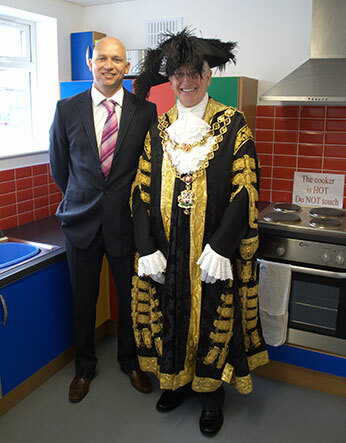 Click here to find out more about the completion of Altecnic offices in Stafford. 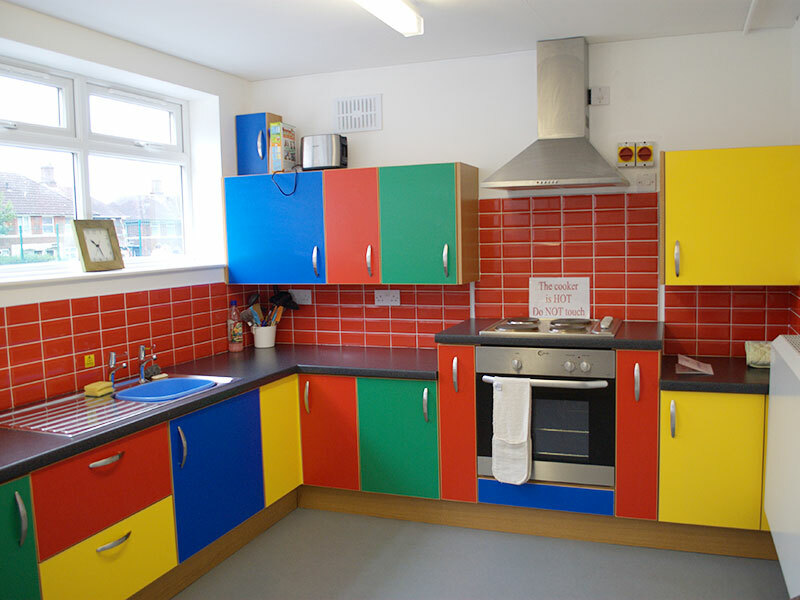 Continuing works on Princethorpe Infant School in Birmingham. Woodfellas awarded carpentry and joinery package for Lancaster House in Newcastle-under-Lyne City Centre by Thomas Vale Construction. Managing Director, James McLaughlin has been invited to be Chairman of the West Midlands area for the Institute of Carpenters in London. This is a prestigious appointment; Members of the Institute of Carpenters are associated with the very highest standards of craftsmanship and professionalism. They have the prestige and public recognition of belonging to a highly respected organisation. Woodfellas reputable name recently appeared on the BBC's The One Show, regarding good names for businesses. This new exciting development is scheduled for the summer of 2009. All apartments will be constructed using the latest environmentally eco friendly materials and comply with the highest insulation values. Click here to see more about this development. This forthcoming extension is situated in Cotton Hackett, Birmingham. The project consists of the conversion of the downstairs garage and storage space with the rear of the building extended to accommodate a new dinning area, removing the existing traditional back door and window frame, replacing with new bi-folding doors opening onto a landscape of a children's play area, decking and barbecue and over looking the splendid Lickey hills, completion scheduled for the spring and summer 2009. Click here to see more about this development and a detailed description of the project here. Many thanks to Mohammed Iqbal for his kind comments about Woodfellas. You can read what he had to say here and view the project report here.